The Las Vegas Convention Center is one of the busiest facilities in the world - a 3.2 million square foot facility located within a short distance of more than 100,000 guest rooms. Operated by the Las Vegas Convention and Visitors Authority (LVCVA), the center is well known among industry professionals for its versatility. In addition to approximately two million square feet of exhibit space, 145 meeting rooms (more than 241,000 square feet) handle seating capacities ranging from 20 to 2,500. A grand lobby and registration area (more than 225,000 square feet) efficiently link existing exhibit halls with new exhibit and meeting rooms, and allow simultaneous set-up, break-down and exhibiting of multiple events. Parking spaces for the disabled for both regular vehicles and vans are available at our facilities for properly identified vehicles. Automatic doors are installed at the most frequently used entrances for our disabled visitors. TDDs (Telecommunications Device for the Deaf) are permanently installed at various locations throughout the facilities. Directional signs are posted at every bank of pay phones or, see the Accessibility Map of each facility for their location. At $.35 per square foot per show day, the cost of Las Vegas Convention Center exhibit space is highly competitive with other facilities. Thirteen exhibit halls (1,940,631 sq.ft.) separable by movable walls. Lobby and Concourse areas of over 109,500 sq.ft. 144 meeting rooms, with seating capacities ranging from 20 to 7,500 for meetings or convention trade show exhibit booths. Room combinations offer meeting expansion versatility. Accessibility directly from parking lot to floor. However docks are available at east end of North, Central and South Halls with levelers. Ramps needed if not using docks. Exterior on-site crate storage. Underground power distribution and telephone/Internet service in parking lots Silver 1 & 2 and telephone service in Gold Lots. Parking for over 10,000 cars. Depending on the event, parking may require a daily fee. Buildings are ADA Compliant. Elevator service available to second level meeting rooms and office areas. Satellite antenna pads available on the roof. Free wireless Internet access available in all common lobby areas and meeting rooms. Meetings Description: The Las Vegas Convention Center is known as the World Trade Center Las Vegas - a designation in partnership with the Consumer Electronics Association and through a license with the World Trade Center Association. In an effort to draw more international attendance, The Consumer Electronics Association and the LVCVA recognized the value of the World Trade Center designation as a key part of bringing this growing segment of convention business to Las Vegas. Several Las Vegas Convention Center policies have been put online for your convenience. To obtain a complete listing of policies, please refer to the Building Users Manual. Please refer to the manual for information about the requirements for service contractors and display houses before providing services (constructing or setting exhibits). 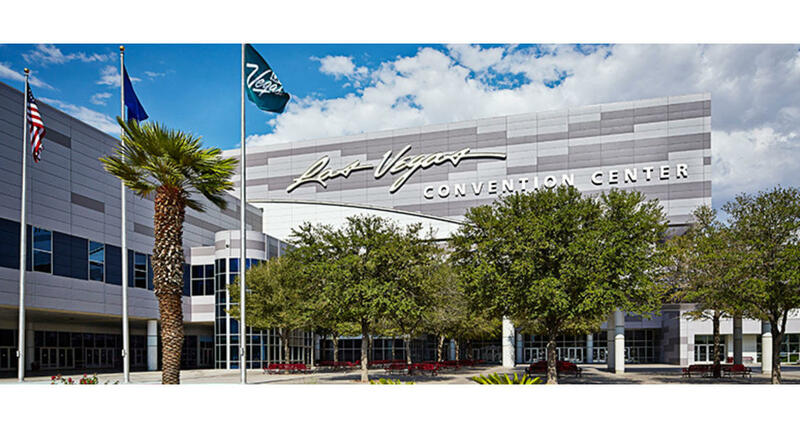 The Las Vegas Convention Center offers a spectrum of high quality services complimenting its convention and meeting facilities. With full service kitchen facilities, two restaurants with seating for over 1,300, 18 concession stands, and a Starbucks cafe, every culinary need can be met with a taste of Las Vegas. Event services include a master antenna system, local, cable and closed circuit television; registration services operated on a fee basis; and badges and badge holders available upon request. Digital-display network throughout the LVCC. Strategically placed monitors range in size from a 55” monitor to our 14’ x 40’ grand lobby display. American Express Business Lounge - Through our Global Commercial Services division, American Express offers powerful backing and support that helps companies of all sizes gain financial savings, control and efficiency. We provide a suite of payment and lending products, solutions for travel and everyday business spending, cross border payments, global currency solutions, and business financing. Their lounge is located on the left after entering through the Central Hall main entrance. This Building Users Manual is intended to assist you in working within the Las Vegas Convention Center. The Las Vegas Convention & Visitors Authority (LVCVA) is committed to building on our current successes and maintaining a proactive approach towards future sustainable activities such as recycling, green purchasing, education and conservation programs. Read more about our Sustainable Initiatives here. Planning and completing a successful event is difficult at best, but knowing our policies can make your job easier. A Convention Services Manager (CSM) is assigned to every event holding space in the Las Vegas Convention Center. Since policies have a way of changing, your assigned CSM will ask you for your e-mail address so we can keep you informed of any revisions. Your CSM will also handle any special requests and answer any questions you may have about the facility.